Looks good and glittery! I dig it. Will have to see in person, but it looks excellent in the promo shot! Which, of course, you can click to enlarge and see them a little bit bigger. Comet's Collar and Drummer Boy look intriguing! Can't wait to see swatches of these. so excited.. 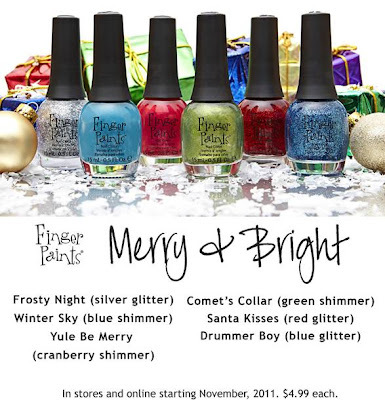 I love Finger Paints Holiday collections.. looking forward to picking them up! These look really nice. Can't wait to see them swatched. I don't seem to get good coverage from this brand. Like the price point - a bit hard to find in my area however and seems when I do find it - it's all picked over. Will be glad to see swatches however as I am soooo missing the great old real holiday collection from OPI yet another year. I look forward for months to see who has what for holiday. I had seeing OPI move away from the official holiday collection. Curious to see this in person, too. I haven't dabbled much into this brand. Very cool series of polishes. It's too bad they're not sold in my part of the world.